There are now so many press articles, interviews and goodness knows what else about the Flight of The Conchords and their HBO series, I've decided to compile all the HBO related ones here. Boston Globe has a two page Conchords article online. 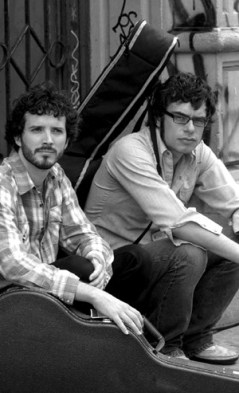 Marc Allen has a short interview with the Conchords online. Jemaine tells the world he fancies toothbrushes and Bret recommends a great little cafe on Kantara. Buddy TV also has an article on the Conchords online. LA Times has an article/interview with the Conchords. Some interesting snippets can be found there. Brian Logan, Guardian writer and long time Conchords fan wrote an article about how well the Conchords have done since their days gigging in a cave. EW.com has a review of the Conchords TV show. Rebecca Barry over at NZ Herald writes about the Conchords. I won't mention how some TV stations/networks over in New Zealand were a bit dumb and passed up on the Conchords in years gone past. Oooops, I guess I just did. Ah well, the HBO show has been picked up by Prime (who beat TV3 to it) and will air there later this year. Lets hope the Conchords overseas success story opens the door to more home grown comedy on TV in New Zealand. Pay attention TV bigwigs! - You may not have good taste but 1.5 million TV viewing Americans and goodness knows how many Kiwi, Brits and <insert long list of countries this site has had hits from here> can't be wrong! The NZ Herald reports mixed reviews from the US critics. Chortle UK reports more of the same. A couple of Conchords HBO reviews, San Francisco Chronicle liked, Reuters Hollywood Reporter didn't. Now Toronto talk Conchords and tiny TV subgenres. Oooerrr! The Philadelphia Inquirer ran an article on the Conchords HBO show. TVNZ ran an article about the Conchords and the HBO series. Over 100 days straight working on the show! In need of a holiday methinks. Washington Post has a Conchords review. Its in the 'we like it' camp! TV Blend have a Conchords article online. New York Times HBO Conchords review - The New Zealand Invasion: Digi-Folk Now! New York Observer - The Sopranos' is done! Will New Zealand’s folk parody duo Flight of the Conchords keep the network from getting whacked?